THE PP has won the Spanish election, increasing its number of deputies, but failing to secure an overall majority of 176. 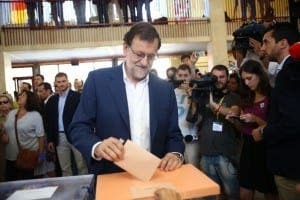 With over 95% of votes counted, Mariano Rajoy’s party were predicted to win 137 seats, an increase of 14 from December. PSOE are set to came second with around 85 seats despite exit polls predicting Unidos Podemos would overhaul Pedro Sanchez’s party. But the result is set to be the PSOE’s worst in its history. The Podemos-IU pact appears set to win 71 seats to take third place. Overall turnout was 69.02%, down from 69.67% in December’s general election. The result leaves Spain in limbo once more, with a coalition government now necessary to reach 176 seats. In Andalucia, PP won 23 seats, up from 21 in 2015, with PSOE taking 20 seats, down from 22. Unidos Podemos won 11 seats with Ciudadanos taking seven. Earlier in the night, El Pais reported that PP leader Mariano Rajoy was ready to offer the PSOE a deal. A pact between the PSOE and Podemos would fall short of 176 seats. How very depressing. A week of extremely bad news. I would have been amazed at any other outcome sadly. Just what the struggling country does not need right now. Only in Spain. Just looking at the map of Spain at the top of the story. It looks about 90% PP light blue. How on earth is it that they only have 137 out of the 350 seats? It IS odd Dangly. The bar-type illustrations seem to have a more even spread. Perhaps OP can enlighten us?